Air Asia Promos 2019 to 2020: Promo Fare to Sydney, Australia! Promo Fare to Sydney, Australia! AirAsia Zest Promo Fare: Here’s the promo for our newest Fly-Thru service! 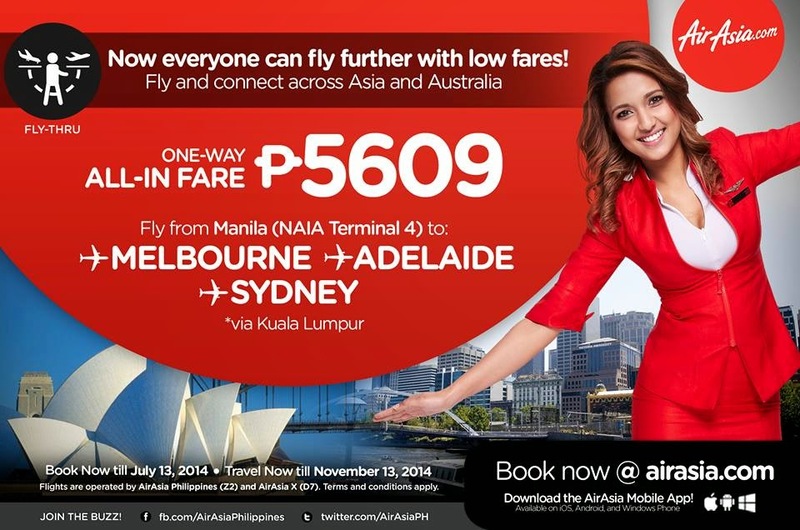 Fly from Manila to Sydney, Melbourne & Adelaide, via Kuala Lumpur, from as low as P5,609 ALL-IN fare! Yes, that’s already an all-in fare! We want everyone to fly, but we wouldn’t just stop there. We want you to fly X-tra long with our X-tra low fares! Australia is within your reach, now with low-cost flying but with world-class experience! Book now at http://airasia.com/! You can also book using your smartphones! Download the AirAsia Mobile App now at http://airasia.com/apps to book, manage and check-in your flights anytime, anywhere! Cash payment is available for web and mobile booking via our payment partners: 7-Eleven, Bayad Center, Cebuana Lhuillier, Robinsons Department Store and ECPAY. What are you waiting for? Fly and connect conveniently via our X-tra long flights operated by AirAsia Philippines and AirAsia X! ‘Share’ this X-citing promo with your family and friends now!